Shadow was created by Gerald Robotnik to stand against the threat of Black Doom and the Black Arms. Shadow reappears on Mobius with an explanation of how he survived his apparent death: an alien race, the Bem, rescued him so he could combat their enemy, the alien Xorda, buying the Bem time to escape. 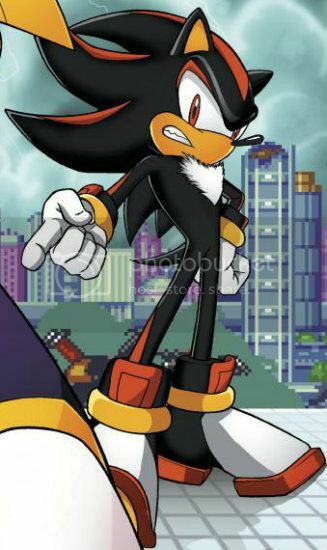 However, Shadow could not defeat the Xorda (even in his super form) and plummeted toward Mobius. He survived the fall and was found by Sonic, who brought him before Maximillian Acorn so that he could warn him of the impending threat of the Xorda, allowing the House of Acorn to amass an army of allies to stand against the Quantum Dial weapon. Shadow often works alone to achieve his goal, which is to discover the truth about his mysterious history. He has at times allied with Sonic and the Freedom Fighters to fight greater evils, like the Xorda, and he has been known to work either for or against Dr. Robotnik depending on the circumstances (once even threatening to kill him). Often, he will side with whomever he believes will bring him closer to the truth. This search has led him to interact with various other characters, including the robot Isaac, Brotherhood of Guardians member Locke, and various versions of Metal Sonic. Shadow also has some connection with the being or beings responsible for the creation of Croctobot, the robot created from a fusion of Crocbot and Octobot. In addition to Sonic, Shadow has also established a rivalry with Scourge the Hedgehog, an evil version of Sonic from another dimension and former leader of the Anti-Freedom Fighters. He has also sworn to protect Hope Kintobor at all costs, viewing it as atoning for Maria's death since Hope is one of the few living beings to show compassion towards him besides Maria, and also bears a striking resemblance to her (enough so that he nearly mistook Hope for Maria at one point). Like Tails, Shadow was kidnapped by the nanite villain A.D.A.M. and used to gather all the Chaos Emeralds in the unvierse, but later used his Super form and Chaos powers to send them to the Zone of Silence. He eventually gained possession of a copy of Professor Gerald's diary, and learned from it that he had been created to protect Mobius from the return of the Black Arms. Resolving to fulfill his creator's wish, Shadow joined the Guardian Units of Nations, or G.U.N. He later arrived in New Mobotropolis in response to a distress call from Sally Acorn, and engaged Enerjak, a brainwashed and superpowered version of Knuckles the Echidna. By removing his power inhibitors, Shadow was able to match him for a time, but failed to maintain his power long enough to defeat him before Enerjak was captured by the Egg Fleet.